Is the UK having a rethink on Brexit? Much has been made of the potential for a second referendum on Brexit, but have the British public changed their minds since 2016? Drawing on recent polling data, Thiemo Fetzer writes that there is an observable shift away from support for Brexit. This is happening along a key characteristic: how exposed a local authority district was to austerity in relation to the welfare reforms enacted since 2010. New data from a comprehensive Survation poll covering around 20,000 respondents across the whole of the UK suggest that a significant shift is underway. The large size of the poll and the sampling method used make it suitable to construct meaningful and quite precise estimates of Leave vote shares at the local authority level. Naturally, this allows for an analysis to see which places saw significant swings in support for Leave. The headline figure suggests that there is now a significant majority for Remain, with Leave trailing by eight percentage points. Yet this headline figure hides an important geographic dimension to the UK’s change of heart. That geography is important to understand the EU referendum has been documented in a wealth of studies (see for example here, here, or here). The analysis of the Survation poll data that I conducted together with Eleonora Alabrese suggests that the UK is having a change of heart and this change of support is happening along a key characteristic: how exposed a local authority district was to austerity due to the welfare reforms enacted since 2010. The more exposed an area was to austerity, the bigger the reduction in support for Leave we see – as is visually plotted in the below figure. The case of Blackpool serves as a good illustration. Blackpool was the area that was estimated to be worst hit by austerity due to the welfare reforms, costing each working age adult there around £900 per year. There, support for leave is estimated to have declined by a whopping 10.7 percentage points falling from 67.5% to 56.8%. Note: See here for further details. Geographically, the figure highlights which areas see the most significant swings. The more yellow an area, the larger is the estimated swing away from Leave towards Remain in the below figure on the right hand side. The left panel plots the geographic distribution of the austerity shock measure, capturing the magnitude of the financial losses due to welfare reforms since 2010 (see here for more details). It is quite evident that the areas that appear in shades of red in the left-hand figure correspond to areas with the most significant swings away from Leave towards Remain in the right-hand figure. Focal areas are specifically Wales, Cornwall and the heart of England along with the Eastern Coastal parts of the North. Many of these areas are traditional Labour party heartlands. Not surprisingly, as is plotted out in the below figure, the areas most strongly switching away from Leave towards Remain are those that historically voted strongly for Labour. 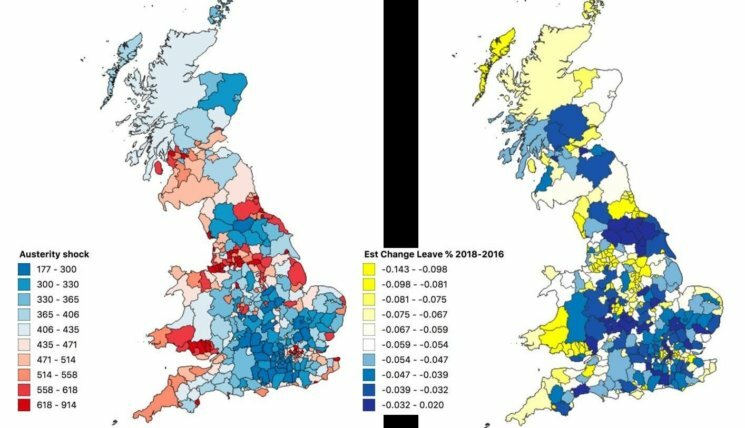 In order to understand why those areas most affected by austerity, many of which are also the traditional Labour heartlands, see the most significant swing away from Leave towards Remain, it is important to understand why a non-negligible share of people in these areas voted Leave in the first place. 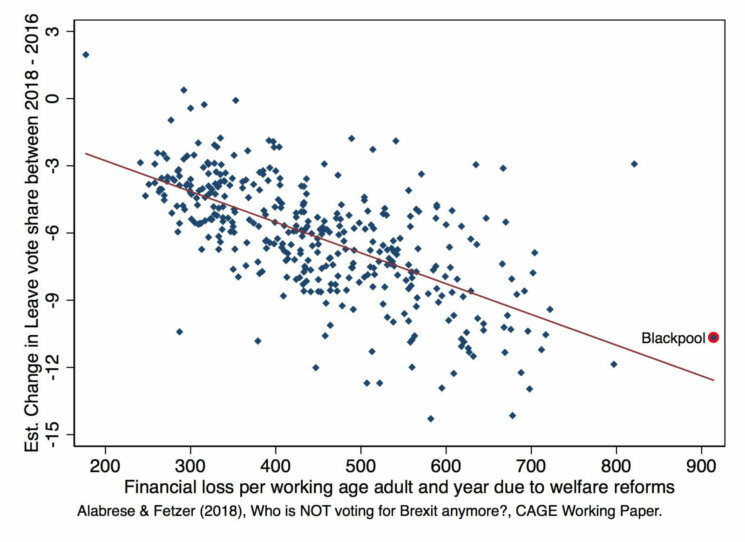 In a paper I published earlier this summer, I presented comprehensive evidence suggesting that austerity-induced welfare reforms since 2010 were an important catalyst, contributing to the build up of anti-establishment sentiment among the electorate that long felt disconnected from the political system. That paper also shows that this very same set of people have long lost out economically in relative terms, due to structural changes that increase the growing skill-bias in the labour market. Welfare payments were helping to even out these growing divides, making their effective curtailing and withdrawal from 2010 particularly severe and producing a backlash that was long in the making. As a result, individuals exposed to benefit changes, once they became effective, were significantly more likely to see increases in their perceptions ‘that public officials do not care’, that they are ‘not having a say in what the government does’ and that their vote is ‘unlikely to make a difference’, in addition to driving support to UKIP and for Leave. Many voters were not wedded to the idea of Brexit as Brexiteers have now recast it since the referendum, with No Deal now being suggested as the only true Brexit. This lies in stark contrast with the Leave-side’s referendum campaign, which promised that the UK’s place in the Single Market would not be threatened. Now that the veil of ignorance has been lifted and many of the unscrupulous promises made, specifically by the Leave campaign, have been exposed as wishful thinking (as most experts predicted), members of the UK public are waking up to the fact, that there is no Brexit deal that will open the door to the land of milk and honey. In some cases, Leave campaigners in active politics are reneging on campaign promises, such as the promise that the UK’s place in the single market would not be threatened by Brexit. The switch in public sentiment is driven by those Leave supporters who were not wedded to the hard Brexit that most leading Brexiteers have made of it since 2016. The Brexit debate has had a significant upside though: more and more young people are engaging in politics and hopefully, this will enrich and deepen democracy going forward and bring new creativity and new life to the political process. My research suggests that Brexit itself should be interpreted as a symptom of a long sequence of political failures to tackle the underlying social and economic problems, which austerity had laid bare. Once the Brexit elephant is out of the room, in some form or other, these problems will finally need to be tackled. The question is, whether politics can deliver. Thiemo Fetzer is Associate Professor in the Department of Economics at the University of Warwick. His ongoing research includes work identifying and quantifying the economic origins of political instability and populism. I notice NI is not included in the Survation poll. When I checked following the channell 4 program last month there were no figures for NI. One of the findings channel 4 gave was that those who voted leave in 2016 were still planning to vote leave. They claimed that the difference stemmed from new voters not from anyone changing their mind. Is there more recent evidence to show that those who voted leave are now changing their voting intention? That Survation poll of 20,000 has been exposed as a fraud. 1) It asked people to score from 0 to 10 how likely they are to vote in the next GENERAL ELECTION (not a referendum). So anyone responding (say) ” 4 ” had their Brexit response de-valued to 0.4. 2) After the G.E. question, respondents were asked which Party they would vote for. UKIP (and others) were hidden. 3) A further question about General Election voting was asked. If the response was “Undecided” or “Refused” .. their Brexit response was discarded. So in 3 different ways, Leave votes had their Survey response either devalued or omitted. ” Full data tables for the questions above can be viewed >here< "